Gao Jun talks about her last eleven years. Gothenburg: Sweden’s number-two city. In 1993, 24-year-old Gao Jun won a difficult bronze medal here to finish her career in the Chinese national team. She then embarked on a trans-Pacific bitter-sweet affair with table-tennis. As one of the best fast-attack pips-out penholders on the national team in the late 80’s and early 90’s, she made it to the final 4 in the 42nd World Championships singles event. That was at the peak of the “Overseas Troops” phenomenon, when on the same day, two top Chinese players Deng Yaping and Qiao Hong lost respectively to Chinese expatriate players Jing Jun Hong and Jie Schoppe. In the semifinals, Gao played former Chinese national team member Chen Jing, who now represented Taipei. She could not establish her forehand attacks or her backhand blocks, and lost easily at 0-3. Since the 41st Worlds women’s team finals, when she lost consecutively to Koreans Hyun Jing Hwa and Yu Sun Bok, Gao continued to give us the impression that she always came up a little short. The bronze medal was only a couple of steps from the gold, and she finished her national team career on a not very satisfactory note. I have always loved playing table-tennis. But after the 1993 Worlds, I said I did not want to play anymore. It was not because I had played enough; it was because the pressure was too great. Playing became painful, and I stopped enjoying it; I got sick of the game. I was still young then and in good shape. In that Worlds, I was the only Chinese player to make it to the final 4. In the semifinals, I felt that I could not make it, and that I could not hold it up. Because everyone had lost already, I felt an unbearable pressure. I feel that I lost to Chen Jing not because of my techniques, but because of my mental state. If I had beaten her, I would not have been at any disadvantage playing Hyun Jing Hwa. Why did Chen lose to Hyun? I believe it was also due to mental reasons. She faced Hyun before, and she won just about every time they played. At the finals, she felt she could win, but she lost 0-3. Of course she might not have faced the same amount of pressure that I did, but definitely her thoughts were affecting her performance and her execution. So I stopped playing for a few years, and I basically did not touch my racket. Also, I developed some hormonal problems when I got to the US. I could not do a lot of exercises, because my heart would beat too fast. At that time, my life consisted of going to work every morning, and coming home every evening. Later I started playing casually. I felt great every time I played, and I felt that it was a lot of fun. Occasionally I would play in a tournament, and no one could beat me. I felt really good. The 1999 English Pro-Tour Open was the first time Gao appeared on Chinese TV, wearing the USA uniform. Her new hairstyle, and the slight weight gain, seemed to tell everyone that this was a new Gao Jun. One thing that had not changed was her style and her unusual individuality. In that tournament, she made it into the semifinals but lost to the French player Anne Boileau. The Sydney Olympics was the second Olympics for Gao Jun. 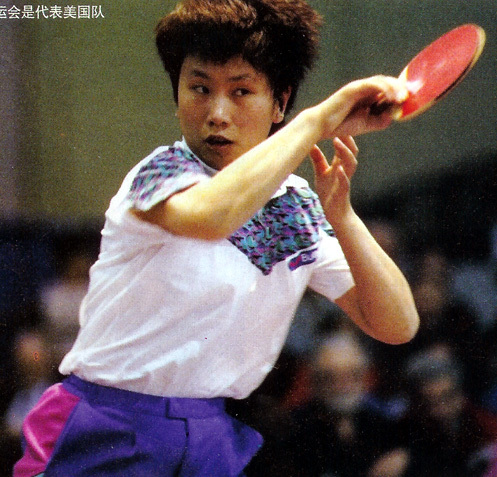 At Barcelona in 1992, Gao and her partner Chen Zihe were silver medalists, losing to Deng Yaping and Qiao Hong in the finals. In 8 years, she had changed from a professional player to a part-time player. In the women’s singles, Gao advanced from group play, but lost 1-3 to Korean Ryu Ji Hye. She was satisfied despite the loss, because she did not have systematic training in the US, and she felt good winning one game from Ryu. But how many people knew about the difficulties Gao faced on her way to Sydney? After the Pan-American Championships, some people who were my competitors on the US team felt that I was a threat to them, and jointly filed a case against me with the US Olympics Committee. At this time John Ruge stood up for me, and said that I had obtained a release from the CTTA. With the help of many people, I won that case. I hired a famous female Chinese lawyer in Maryland to represent me. She was taking lessons from me, and she discounted the fees, but still it was close to $10,000 that I had to pay. After I won that case, she helped me apply to the Olympics Committee for compensation for the litigation expenses, because I was not the one who started the law suit. Finally I was reimbursed for all my expenses. So I was under some pressure then, since I felt that I would have let a lot of people down if I did not win in tournaments. This was a different kind of pressure than the ones I faced on the Chinese national team. When I played in the Pan-Am Championships, I did not have a world ranking. After that tournament, I played in the US Pro-Tour and beat Chen Jing. Chen and Geng were highly ranked, so all of a sudden, I was ranked in the top 20. I got an automatic qualification for the Olympics because I was among the top 20. So I made it to Sydney. The CTTA agreed to let me play in the Olympics, and I feel that they showed a lot of class. They also did not try to prevent Chen Jing or Ni Xialian from playing in the Olympics. If they had said no to the ITTF, I would not have been able to play, so I want to thank them for their generosity. I sometimes play a little nervously; if I want to win, I would get nervous. But it is different than before. I used to really want to win and was afraid of losing. Now I just want to win, and I am not afraid of losing. A loss is just a loss now, it is not a big deal anymore. 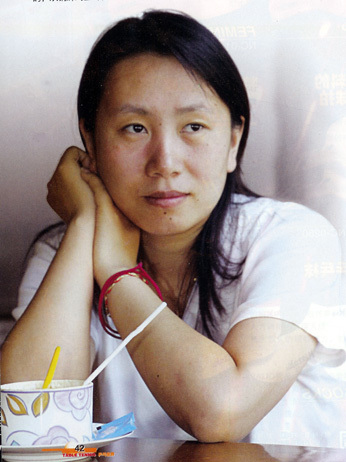 In the beginning of 2001, Gao Jun followed her husband back to China, and lived in Shanghai. Soon after that she played in the 1-B league. Less than two years later, she and her husband went on separate ways. Because of her love of the game and her persevering personality, she has now found a new peaceful space in table-tennis and in the world. We came back from the US in the beginning of 2001. A sequence of unhappy events followed, and we decided to separate. That was at the end of 2002. When I first came back, I had little to do. One time I called up my old coach Tang Yinsheng, and he said that he would find me a 1-B team to play in. I thought that 1-B was probably about my level, and it would be good if I could do well. Actually in 2001, the 1-B league was a very tough league; Li Xiaoxia was playing in that league then. Besides playing in that league, I still did not have much to do, so coach Zhang Xielin told me to go back to school. The East China Polytechnic University had a table-tennis team, and coach Zhang spoke to coach Zang there to arrange a spot for me, as a student in international trade. Coach Zang was happy to have me, and this became another turning point in my life: I have really adapted to going to school and playing on the school team. If you talk about table-tennis, there is a night and day difference between China and the US. When you talk about living conditions and material aspects, of course the US is much better. But apart from those things, what else do I like about the US? There is really not that much. In China, I can also buy a big house, or a big car, if I have the money. But if you want to play table-tennis, you have to come to China. The coaches, the playing levels, and the training conditions here are simply beyond comparison. When I first arrived at the university, Wu Na was not here yet. I roomed with Jiao Yue. We do not have heating in the winter or air-conditioning in the summer, and we use communal bathrooms. But I do not feel uncomfortable at all. First of all, I have very low needs for material things; a plate of fried rice would easily satisfy me. Second, I really miss the time I spent in the national team; I really enjoy being part of a community. I lead a very simple life in Shanghai. In this cosmopolitan city, I wear very simple clothes: a T-shirt, a pair of jeans, and a pair of sneakers are all I need, so I do not spend much. My biggest expense is eating out with my teammates and classmates. They all call me auntie or big sister, so naturally I end up paying the bill. When I was emotionally at the lowest point, they helped me pull through. Right after the divorce I was very unhappy. When I was alone, I felt really oppressed and always wanted to cry. But being in school with a lot of young people, I began to feel that life is wonderful. They helped me step out of the shadows. My coaches and teachers were very nice to me. Sometimes I did not want to practice and just wanted to sleep, and they would let me do that. I feel happy now. The state of mind is very important, and I feel that I am what the northeasterners call “poor-but-happy”. I spend most of my time on the campus and seldom go out. I do not have much contact with the table-tennis community in Shanghai, except with the Butterfly representative here since I use Butterfly equipment. In today’s loop-dominated game, the pips-out fast-attack penholder style is a vanishing style, but it had its bright moments. After Dai Lili, Gao Jun, Yang Ying and Zhang Yingying, there is no more female player with this style on the national team. This once blossoming style is now a thing of the past, and we feel a certain amount of helplessness and sadness. Gao Jun is the lone star left, and in the 2003 Worlds and the December 2003 World Cup, she shone brightly. In Paris, she beat the top chopper in the world, Kim Kyung Ah. At age 34, Gao barely lost to Boros in the quarterfinals. At the last Women’s World Cup in Hong Kong, she beat Wang Nan 4-2 to make it to the final 8. In the recently held Korean Open, she and Wosik of Germany beat China s Olympic pair Niu Jianfeng and Guo Yue. In singles, she lost a close quarter-finals match at 3-4 to eventual winner Zhang Yining. In the following Singapore Open, she beat Boros. Boros’ overall skills are not as fine as the Chinese players’. She has power, but only on that one stroke. When she plays the short balls, you can force her into errors if you put in a little bit of variation. You don’t see this in the Chinese players. In the past, there was less demand on the skills of the pips-out penholder, but now, if you want to play this style well, you need to meet a lot of requirements. You have to be smart, you need a great touch, and you have to have power as well as quickness. If you meet all these prerequisites, and you have a solid game, then you can challenge the shakehanders. In the end, both styles need to have very tight control. Serve receive techniques are now better than in the past, and the overall strategies have changed. I feel that the pips-out penholder style is very difficult to play well, although I can't say that it is impossible. When I was on the national team, I especially hated the “overseas troops”. We did not want to have to prepare for the expat players in addition to the foreign players. Losing to the foreigners was one thing, but losing to an expat Chinese player, now that was really hard to accept. But now I am one of the overseas troops. I know how it feels on the other side. We don’t have training partners or good coaches, and we are more than 10 years older than the national team members. How can we beat them? We can’t. People on the US team asked me several times: “Are you backing off when you play the Chinese?” They should try it themselves. That must have been how those expat players felt when they played us, the national team members. Just like when I play Wang Nan, Zhang Yining, and Niu Jianfeng now: if I win one game, I feel very happy. Now and then I would win a match, and perhaps it is because of this attitude. Like last year at the World Cup, I was shopping with Jiao Zhimen before my match against Wang Nan. It was a 9 pm match, and I missed the 8 pm bus because of the shopping. My mind was not really on that match, because I felt that there was no way I could win. But then, serendipitously, I did, although I could not remember how. I only remember there was only one table in the playing hall, and I did not even have a coach; I felt ashamed, it was a loss of face. At the Korean Open, I should have quickly lost to Zhang Yining. Perhaps 2-4 at the most. In that 6th game, I was especially lucky. I fell behind, but then I got an edge here and a net there, and that seemed to have messed up her game. She caught up, but at 10-8 I got another net, otherwise I would have lost in 6 games. When I played them, I feel great just winning one game. It was wonderful losing 3-4, regardless of how many edges and nets I got. Wosik asked me to play doubles with her, and before then we had never even spoken to each other. I agreed because I had free time, and it did not really matter who I partnered with since I never expected to win. Later I found out that Li Huifun (Hong Kong’s coach) wanted me to partner Zhang Rui, but by then Wosik already had signed us up with the tournament committee. We made it through the qualifying rounds, and the first match in the final draw was against Niu Jianfeng and Guo Yue. Perhaps they never took us seriously, but we played really well at the end of that match. I think Niu and Guo would rather play some of the better pairs that they have prepared for, instead of playing us who looked like we were not trying hard but in fact were really trying hard. Actually Niu and Guo were very good: Niu especially had very good control, and Guo attacked very strongly. But perhaps of their ages, they lacked experience, and did not had a great grasp of their techniques. They are always a great threat, but in comparison Wang Nan and Zhang Yining are a more steady pair. Assuming under equal pressure, no other team could beat the Chinese team. In this small café next to the university, what was scheduled as a 30 minute interview stretched into a 90 minute one. Gao Jun’s frankness was unexpected. Whether she was talking about pleasant things or not-so-pleasant things, she was straightforward and never tried to hide her feelings. I was on the national team for about 8 years, and the coaches had been very nice to me. Like Zhang Xielin, my coach Hui Jun (now Hong Kong's head-coach), Hua Zhengde, Xiao Xingguo, and Ceng Chuanjiang. Sometimes there was friction among the players, but I never minded that. When I left the team, I had conflicting emotions. I really loved the team, and did not want to leave. I still really miss it. I have not made a lot of contact with my teammates, other than the several that were especially close to me. But whenever we meet, we still feel that camaraderie. I have the most contact with Jiao Zhimin. During the Korean Open, she asked her husband Ahn Jae Hyung to drive from Seoul to pick me up. I thought I was going to be eliminated early, but I lasted till the quarter-finals, so he had to wait two days. In the Super League matches I sometimes run into Qiao Hong. She is the league's technical advisor, and I also saw her in international tournaments. It was great spending time with her, and we often exchange short messages. I sometimes talk to Chen Zihe on the phone; she has a son now. Once I met Deng Yaping in Shanghai. We had dinner together, and it was great. I also talked to Qiao Yunping on the phone. The people in our group are all doing quite well, and each of us has found her own space. To be honest, when we were in the team, there were some conflicts because of the competition. For example, at that time Deng Yaping really bothered me. Why was she always so merciless and ferocious? I was not used to her personality. The day I put away my racket, I immediately understood: you couldn’t beat her, so you came up with excuses. If you can’t beat someone, you are just not as good. Looking back, people like Deng Yaping were actually perfectly good people. I do not have any goals in Athens, except to enjoy myself. To put it bluntly, and it is a little embarrassing, I value the Pro-Tour tournaments more, because I can make some money if I win. There is no money in doing well at the Olympics, and I can’t win anyway. Who can I beat? They are so strong, and they have been training so hard. At the university, I have worse training conditions than overseas, let alone the national team. So I do not make any demands on myself. While the national team is furiously preparing for the Olympics in Xiamen, ex-member Gao Jun speaks her mind so freely. After 29 years of playing, Gao, at 35, has no more needs from this sport.